This coral does best in an established tank. It prefers a high water current and a moderate/high light level (300 to 600PAR), so does best in the middle to upper regions of the tank depending on the lighting. Needs stable water parameters to thrive, and adiquate calcium to grow. 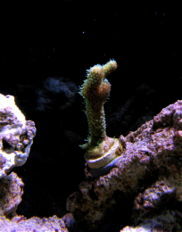 A SPS coral that has long hair like coloured polyps, and coloured branches. This page was last edited on 8 September 2018, at 04:33.